It does not happen too often that an unknown software company from a small European country becomes a major force in the toy space in one year. But this is exactly what happened in the case of Rovio. It is not that this came about overnight or easily. Rovio started up in 2003 and teetered on the brink of bankruptcy several times. 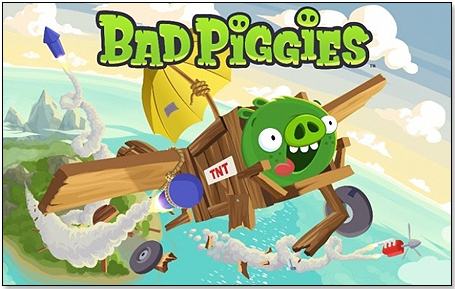 Their turn-around came in 2009 when they hit upon a totally new concept – Angry Birds and Bad Piggies. Their ascent was literally breathtaking. Their estimated sales in 2010 were $7 million, in 2011 $106 million and this year $200 million. 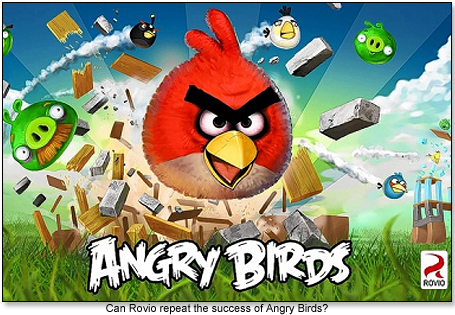 Rovio is expected to go public with annual sales of about $300 million next year. What this does not tell is the fact that about half of the 2012 number comes not from sales but rather from royalty incomes from toy companies. The products themselves are made and sold by other people such as Mattel, K’Nex, Commonwealth Toys, CraZArt, etc., who pay Rovio a royalty on their shipments to the retailers. In other words, Angry Birds and Bad Piggies represent toy manufacturer sales in the neighborhood of US$ 800 million and retail sales of more than $1 billion. Similar success stories have happened before – Cepia with Zhu Zhu Pets for example. However, there has been no toy brand in recent memory that managed to make a major difference in the performance of so many different toy categories – Board Games, Plush, Activity Kits, Building Blocks, Action Figures and Vehicles. Now Lucas and Rovio are trying to achieve another success story in the toy space, with particular focus on Action Figures, with the launch of Angry Birds Star Wars on November 8. Apart from games for mobile apps - iOS, Android, Amazon Kindle Fire, Mac, PC, Windows Phone and Windows 8 – there will be toys in the Action Figures, Plush and Board Games categories, and it is my understanding that a very considerable number of action figure entries are planned for next year. Given that Action Figures as a category have declined in the U.S. since 2009 – a trend that continued into 2012 – such an entry couldn’t come any too soon. While the success of the Angry Birds franchise is undisputed, Rovio’s efforts to broaden its base into other brands have so far not been overly spectacular. 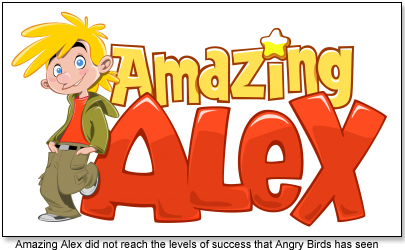 To ensure that the Angry Birds universe is not a one-year wonder, Rovio launched Amazing Alex on 7/21/2012. While it had a very good start, it began to fall off pretty quickly. Equally tellingly, there are no toys out there for Amazing Alex and we can now pretty much assume that this entry will not amount to a game changer. In the case of Bad Piggies it is still too early to say – the first day was spectacular but then so was that of Amazing Alex. There are no toys out there yet either. 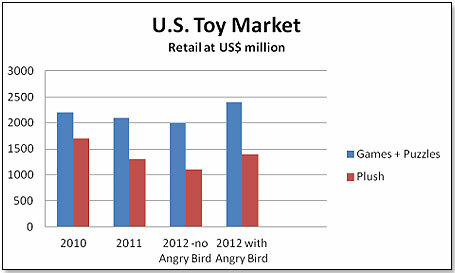 Clearly, Angry Birds continues to be of very strong interest in the eyes of the consumers. Bad Piggies are holding their own, Angry Birds Star Wars peaked early and then dropped sharply, and Amazing Alex is nowhere to be seen. On this basis, I would continue to be very upbeat about Angry Birds and optimistic in the case of Bad Piggies. 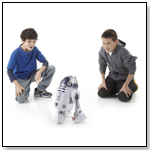 I think that Angry Birds Star Wars will need help if the product is to meet the expectations of both Rovio and Hasbro. What this suggests is that Rovio is holding its own. Unlike the other toy companies, Rovio’s consumer interest levels are not seasonally (Christmas) driven, but given the size of the company, are incredibly strong. However, Rovio began a campaign last month to leverage their toy strength into the video game space, and so far this does not appear to have been overly successful. They entered the console market with the newly minted Angry Birds Trilogy (Angry Birds, Angry Birds Seasons and Angry Birds Rio) for 3DS, Xbox 360 and Play Station 3. The games were released on September 25 and have so far been less than a success. According to my friends at GameStop, the best selling version so far is the 3DS game and it has moved only very slowly in the past four weeks. On a worldwide basis, the same Angry Birds 3DS game is #80 on the sales chart and the other versions – the Xbox 360 and PS3 – do not make it at all. After a very promising peak late last month, when the announcement came out about Angry Birds Trilogy video games, the consumer interest levels again very quickly reverted back to their normal relatively low levels. In summary, the good news for Rovio is that they are likely to continue to be a major factor in the toy space in the immediate future, due to the strength of its major franchise, Angry Birds, and of a possibly successful line extension, Bad Piggies. The bad news is that their efforts to diversify into other key product areas have not brought about the results for which they hoped. And, given their very fickle consumer group, it is essential that they do so in relatively short order. Otherwise, they are likely to face the same fate of slow growth leading to stagnation and decline that has brought so many other toy companies to their knees. · The Wii U is sinking – will it drag Nintendo down with it? · Disney – is Infinity leading the way?